The Bulk Input feature is perfect for entering multiple cash entries simultaneously. From the Main Menu, head over to Input Data and then click on Bulk Input. From the New Projection page, click on the option to the right to access Bulk Input. You can bulk enter your data by copying and pasting from another spreadsheet with columns. 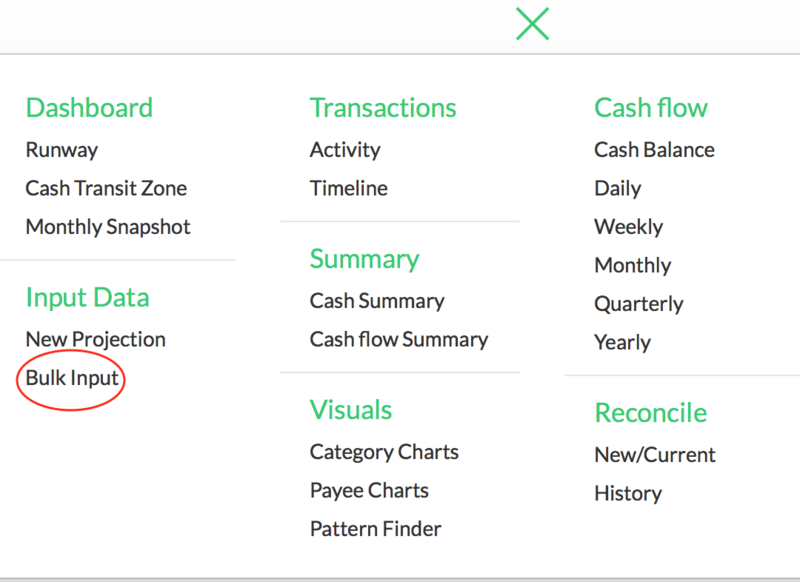 For example, if you use an Excel or Google spreadsheet to record your data, simply copy the entire column and paste into CashVue. If you use an accounting software, you can likely export your data into a spreadsheet and then copy/paste into the Bulk Input table. Once all your data is added, click the blue ‘Add Entries’ button to complete your bulk input.